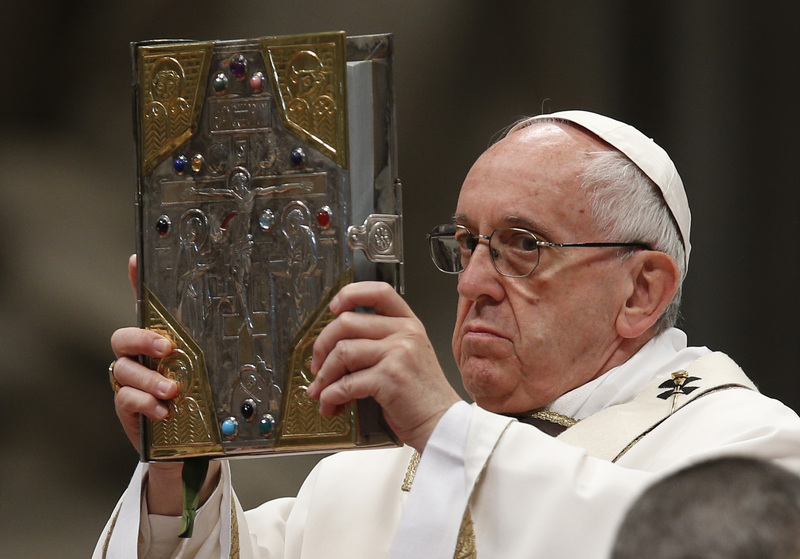 Pope Francis raises the Book of the Gospels in St. Peter's Basilica at the Vatican April 13 (CNS photo/Paul Haring). VATICAN CITY (CNS) — In an increasingly complex world of unprecedented scientific and technological challenges, theologians must communicate what is essential about life and help Christians proclaim God’s merciful, saving grace, Pope Francis told a group of Italian theologians. The theologians’ task requires being “faithful and anchored” to the teachings of the Second Vatican Council and continuing the council's focus on the church “letting itself be enriched by the perennial newness of Christ’s Gospel,” he said. Such a task is done not by changing the message, but by communicating the perennial message with “faithful creativity” to a world experiencing rapid transformations, he said. These changes and challenges require that the church, and theologians in particular, believe that the Gospel “can continue to touch the women and men of today” and work to clearly show people what lies at the heart of the Gospel. This theological effort of showing what is essential is “indispensable” in a highly complex world of unprecedented scientific and technological advancement, and in a culture where “distorted views of the very heart of the Gospel” can sneak in and spread, he said. I am glad that Pope Francis keeps attention on Vatican II. So many people seem to want to return to a time before Vatican II.